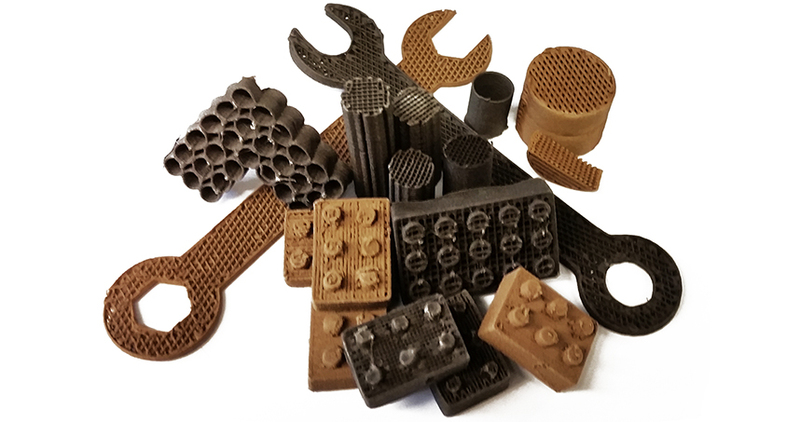 Researchers at Northwestern University have developed a new method of 3D printing using material that simulates the dust found on the Moon and Mars. The work, which has received backing from Google, took NASA-approved Lunar and Martian regolith simulant (LRS and MRS, respectively), and combined them with a series of simple solvents and a biopolymer. The resulting ‘paints’ were then 3D printed via a simple extrusion process, resulting in structures that were composed of 90 per cent simulant by weight. Published in Nature Scientific Reports, the research employs the teams ‘3D painting’ process, previously used to print hyperelastic ‘bone’, 3D graphene and carbon nanotubes. According to the Northwestern team, the ‘3D-painted’ material is flexible, elastic, and tough despite being composed of rigid micro-rocks, and has properties similar to rubber. The researchers claim this is the first time that rubber-like or soft materials have been manufactured using Lunar and Martian simulant, although other parties have been experimenting with 3D printing using LRS and MRS.
Once printed, the material can be cut, rolled, folded, and shaped. As part of the study, Shah and her colleagues produced an array of objects, including basic tools and implements. “We even 3D-printed interlocking bricks, similar to Legos, that can be used as building blocks,” she said. The team is now exploring ways that the material could be fired in a furnace in order to transform the rubber-like objects into hard, ceramic-like structures. For more on extraterrestrial manufacturing, check out The Engineer’s feature from last year, Made in space: new production frontiers.